Breve nota en español: Como os comentaba en este artículo, en SUGES poco a poco vamos sumando el apoyo de nuevos patrocinadores qué se está traduciendo en descuentos para los miembros de la comunidad y en el acceso a productos de los mismos. Lógicamente obtener este apoyo implica también una colaboración reciproca que en el caso de editoriales que publican libros técnicos como Wrox se traduce en la participación en la revisión de libros técnicos (sobre SharePoint en el caso de SUGES) y la publicación de las mismas en los distintos canales dónde la comunidad está presente. En esta ocasión os presento la primera review que he hecho de un libro más que recomendable: Professional SharePoint 2013 Development. Lógicamente, en el caso de Wrox la revisión tiene que estar escrita en inglés de ahí esta breve introducción para el blog. 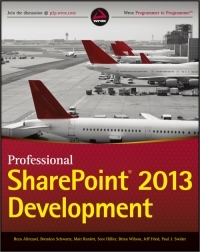 Thanks to Wrox I have had the opportunity to review a great book about SharePoint 2013 development: Professional SharePoint 2013 Development. As the title states, you can expect to find a bunch of great content about how to develop for the platform following best practices and providing a deed overview about new features coming in the product. In more than 800 pages you can find great content about how to develop for SharePoint 2013 using the Office Development Tools for Visual Studio, the fundamentals of the new SharePoint App model and new workflow architecture and also how to build different kind of solutions and applications using the new APIs available in SharePoint 2013: social Apps, Search-based Apps, ECM solutions, business data integration through BCS capabilities, among others. Finally, don’t miss the Business Intelligence contents included in the book where you will have the opportunity to learn about the complete BI stack available in the SharePoint 2013 platform: Reporting Services integration, Excel Services enhancements, what’s new in PerformancePoint services and how to build business solutions using the power of Microsoft Office Access 2013 and the new Access Services. First chapter provides a quick and comprehensive description about SharePoint 2013 architecture in terms of out of the box services, installation topologies and how to achieve high availability at different levels in a SharePoint 2013 farm. In chapter 2, you can find a great overview about development approaches available in SharePoint 2013 like the classic development model through SharePoint solutions, the new App model (including remote event receivers) or what’s new in workflows. This chapter is a great reference to support important decisions when choosing solutions or Apps for accomplishing customer requirements. I also recommend to read in detail the great description provided about the new workflow architecture and possibilities coming in SharePoint 2013 and also the comparison with the previous architecture. There you can also read a great overview about cool features in terms of ECM, WCM (Terms based navigation, cross site publishing, multilingual features and so on) coming with the product. Chapter three is focused in the development tools available to create solutions on top of SharePoint 2013: the user interface, SharePoint Designer 2013 and of course Visual Studio 2012. In terms of SharePoint development with Visual Studio 2012, this chapter describes quite deeply the kind of SharePoint artifacts you can build (classic solutions vs. Apps), the project and items template you have as soon as you install the Office Development Tools for Visual Studio and the different designers included in the IDE (like the feature designer, the package designer or the manifest designer) which simplifies the process of packaging and deploying the solutions developed to your SharePoint environment (On-Premises or Online). If you want to know the development approaches you have when developing for SharePoint, you must carefully read the chapter about ALM. Here you will learn about the two development models you have in SharePoint 2013: Apps vs. Solutions, best practices for SharePoint development through the use of reusable frameworks, release models one productions is in use and different approaches when setting development environments for your SharePoint team: individual development environments vs. centralized development environment; virtual vs. non virtual development environments; etc. If you want to know out the box capabilities available in SharePoint 2013, you must carefully read Chapter 6. Here you will also learn how to develop Social Apps using the new APIs available in the platform. Chapter 9 provides a deep detailed description about the new search architecture in SharePoint 2013 in terms of the key components included behind the scenes: content processing, analytics engine, query processing, etc. This chapter describes the extensibility points we have (UI, Query, Contents …) and all the new goodies coming in with search: new powerful Web Parts like the Content By Search Web Part, the new way to show search results by means of display templates, the resource types concept, etc.). Additionally, you will read about some development concerns like the new search APIs exposed by the Client Side Object Model (CSOM) and the REST API or the search connectors framework. In case you are thinking to build SharePoint 2013 publishing sites, you have to review WCM chapter. Here you can expect to find all the new capabilities Microsoft has added like defining site navigation using the manage metadata service application, SEO improvements by means of new SEO properties and the separation between content and navigation, friendly Urls, and so on. You will learn the branding approaches you have in order to customize the look & feel of SharePoint 2013 sites: the user interface and the new themes infrastructure, SharePoint Desinger 2013 and the new Design Manager that allows to use any web design in SharePoint sites. Finally, the chapter also cover other great WCM capabilities available in the box like image renditions as a way to work with different image resolutions generated by SharePoint from a single source image, the device channels mechanism that simplifies how to configure SharePoint sites to be properly displayed in different devices and browsers or the product catalogs feature. Chapter 11 is intended to refresh the capabilities of InfoPath and InfoPath forms services. From a practical point of view, this chapter describes how to customize list forms by using InfoPath and how to use business rules and views to create rich data visualization with zero programming. In order to learn about new and improved ECM features in SharePoint 2013, I recommend you to read the ECM chapter. Here you can find a summary of all the ECM features you have in the platform distinguishing between the ones coming from SharePoint 2010 and the new ones added to SharePoint 2013 like Team Folders, In-Place records hold and the CSOM/REST APIs. This chapter takes special attention to ECM features like the Document Center, the Content Organizer, how to define and use meta-data navigation to easily find and navigate through content), the records management, new auditing features (site and site collection closure and deletion) and eDiscovery. Chapters 13 and 14 are focused on the Business Connectivity Services (BCS) capabilities in the box. On the one hand, you will learn about the new things coming with BCS: support for OData sources, App-Level External Content Types (ECTs), CSOM/REST API for BCS, support for event receivers in external lists and ECTs and performance improvements added to BCS. On the other hand, you will find good examples about how to integrate in SharePoint information coming from different LOB systems: SQL Databases, Oracle Databases, WCF Services, etc. Both chapters provide good examples about how to create ECTs with SharePoint Designer 2013, Visual Studio 2012 and how to define and use ECTs at the App-Level. One of the biggest changes in the SharePoint 2013 is the new workflow architecture that is not in the box anymore. Chapter 15 describes the new Windows Azure Workflow Server that allows to expose workflows as a services in order to be used in SharePoint 2013 or other platforms. When talking about SharePoint 2013 workflows, you will see how easy is to set up the Workflow infrastructure by means of the Workflow Manager, the different tools to create workflows (Visio 2013, SharePoint Designer 2013 Workflows) and also some good examples about how to create workflows with these tools. You will learn some specific concerns about workflows in SharePoint 2013: available workflow activities in SharePoint Designer 2013 and Visual Studio 2012, workflow types, associations and association types, non-support for InfoPath forms, etc. Last chapters in the books (16, 17, 18 and 19) provides a detailed overview of all the BI features available in SharePoint 2013: reporting services integration, Excel Services, PerformancePoint services and Access Services. All the chapters are great, but I recommend you the reporting services one and the Access Services one. For instance, in the Access Services chapter you can learn about how to create business Apps with Microsoft Office Access 2013 and publish to SharePoint 2013 (On-Premise or Online) as SharePoint App. Of course, you’ll dig in the internals of the Access Services architecture and the Access Apps publishing process. And that’s all about my review of this great book. I hope you have find it useful and I also recommend you to read this great book. Doubtlessly it is a great source to learn a lot of stuff about SharePoint 2013 development.